Welcome back to Study Skills – bringing you the skills and knowledge you need for successful study and better learning. This time we take a look at a feature of academic study that can be difficult to get right: managing your time effectively. Do you wish you could study more effectively? Of course you do – but there are so many things that demand our attention. These can really damage any chance of studying effectively. Dealing with distractions – like phone calls from your friends and family – is just one thing we need to do. 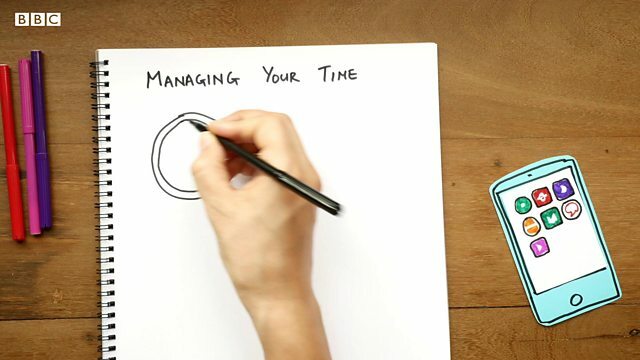 Scroll down to watch the video and pick up the tips to become a master at managing your time! If you want to study well, you need to manage your time. How to do that? First, ask yourself three questions: what your commitments are; what your study goals are; and how you work best. Watch the video and listen for the advice about dealing with your COMMITMENTS, setting your study GOALS, and finding our HOW you work best. Write these tips down if you like, and we'll give you the details – in an activity – later on this page. "Hi Mum. Yes, just filming a video. Can I call you in an hour? OK. Sorry. Bye!" Where were we? Yes, studying effectively. Dealing with distractions is just one thing we need to do. Ah, yes. If you want to study well you need to manage your time. How to do that? First, you need to ask yourself three questions: what your commitments are, what your study goals are, and how you work best. Let's start with the easy one. What are your commitments outside study? What about work, family events, childcare or travel? Write down when these are – and how long they take. You can do this for the whole year or a shorter period. Now you know how much time is left for studying. But is it enough? That depends on your goals, which is point two. Do you want to pass the course or get a specific grade? How much will you need to do in order to achieve that? Take a good look at the syllabus, exam and assignment timetables, and old exam papers to figure out how much you need to do. Sometimes, you need to look at short-term goals. For example: this week, today, and in the next hour. Take a good look at your commitments: you might need to change some if you don't have enough time. Which brings us to question three: how do you work best? In the morning? At night? And where? In a library? At home? With music? In silence? With lots of coffee? Or lots of chocolate? Psst. Try to do your most difficult tasks when your concentration is strongest. Ah. With all this information, you can make the perfect master plan that suits you. But there's a problem: distractions. Sorry Mum. Maybe time to switch off your phone. And the difficult one: procrastination. Why is it that whenever you have a task, everything else appears more interesting? Maybe you need to need to take a desperate measure: switch off your internet connection. And if you need the internet for research, you can load pages you need – before turning it off. And if you still find it hard, try working in short bursts. For example, 40 minutes at a time. You can also do a deal with yourself. How about: I can eat this lovely chocolate, but only after I finish reading this paper. Hopefully, by now, everything's going great. Now remember, even if you make the best plan in the universe you still need to be flexible. And try to enjoy your study. Hi Mum. Yeah, just finished filming now, actually. Hang on, let me switch off the camera. Did you spot the three things you need to think about for good time management? Check your understanding with these questions. You're planning what you want to achieve in the next hour, day and week of your studies. What are you doing? You are thinking about what you have to do have to do for work, family and childcare. What are you doing? You are thinking about where is the best place and when is the best time for you to study. What are you doing? Do you have time for a review? We've had a good look at time management for successful study. Before we finish, let's review what we've learned so far about using your time effectively. Calculate your time commitments outside of study – things like work, childcare or travel – to help you work out how much time you have for study. 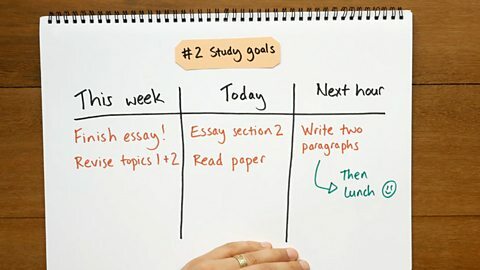 Set yourself clear goals – this will help you work out how long you need to study. Try to be flexible when you need to change your plans. Think about when and where you work best – at home or in the library, in the morning or afternoon – so you can plan effective study sessions. Try to do your most difficult tasks when your concentration is strongest – it's much more difficult to write an essay when you're feeling distracted. Don't fall victim to procrastination. If distractions are a problem, take action! Turn off your phone and internet for distraction-free study time. If you're finding it difficult to concentrate, study in short bursts. Working for 40 minutes at a time is a good way to get things done. Reward yourself for working. When you've finished reading an academic paper, give yourself a treat – maybe some chocolate or a cup of coffee. That's all for now! You can get more tips about studying effectively by visiting our partner – just click on the OU link in the 'Where next?' section.